The West Antarctic ice sheet’s imperiled glaciers get all the attention, but there’s an even larger pile of frozen water across the continent that scientists are starting to worry about. 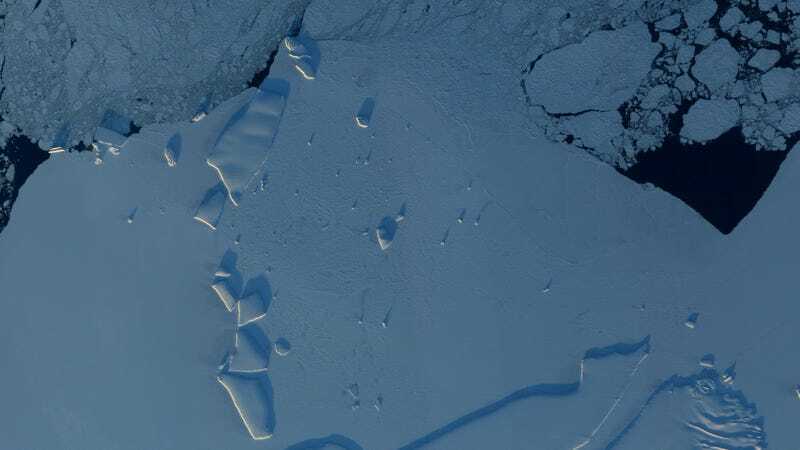 The East Antarctic ice sheet has long been considered very frozen and very stable—but a new analysis of some of its largest glaciers suggests this picture might be wrong. A study published Wednesday in the journal Nature takes a deep dive into the history of East Antarctica’s Sabrina Coast, which empties glaciers flowing off the vast ice sheet blanketing the Aurora Basin. By constructing maps of the sediment layers surrounding the coastline, the researchers determined that its glaciers have only been stable for the past six million years or so. Before that—for the bulk of the period since Antarctica’s continent-wide ice sheets emerged some 34 million years ago—the glaciers protecting the Sabrina Coast went through nearly a dozen cycles of advance and retreat, as the climate cooled off and warmed up. According to co-lead study author Sean Gulick of the University of Texas at Austin, that upends the prevailing picture of East Antarctica, as a landscape that’s been locked in a deep freeze for tens of millions of years. And it raises troubling possibilities about the future of the Aurora Basin ice sheet, which holds enough water to raise global sea levels by up to 15 feet. “It’s kind of a very different picture than East Antarctica today,” Gulick told Earther, adding that this new deep-time picture, of glaciers growing and shrinking, is more like what we see in Alaska today than what we’d expect for the frozen continent at the bottom of the world. The analysis was groundbreaking in more ways than one. The researchers were literally the first to visit this section of the East Antarctic coastline, back in the austral summer of 2014. To get there, the scientists had to take a special icebreaking research vessel, the R/V N. B. Palmer, through fringing sea ice into uncharted waters near where ice shelves are tethered to land. With no baythmetric maps of the seafloor, they had to be careful not to run aground. Once they made it to relatively open waters near the coastline, the researchers used seismic reflection profiling—basically, they shot sound waves into the seafloor and listened to the reflections—to construct a map of sediment layers representing the growth and retreat of glaciers over time. They also collected sediment cores and examined microfossils and pollen grains to figure out approximately when key glacial advance and retreat events occurred. In addition to identifying 11 periods of ice-free conditions—spanning the late Eocene 40 million years ago to the late Miocene 6 million years ago—the resultant seafloor sediment profiles revealed extensive “tunnel valleys,” features that form when meltwater percolates through an ice sheet to bedrock and literally carves out a valley. In this case, those tunnels are kilometers wide and hundreds of meters deep, hinting at a time when vast rivers of water gushed through the ice sheet to the sea. Gulick noted that many of the ice-free periods recorded in these sediments occurred during times when atmospheric CO2 levels were uncomfortably close to where we’re at today. “These are the kinds of [CO2] numbers we’re expecting to reach” by the end of the century, he said. And if the end of the century feels far away, bear in mind that the region’s largest glacier—Totten Glacier, nicknamed “sleeping giant” of East Antarctica—may already be feeling the heat of global warming. Warm ocean water is causing Totten to thin faster than any other East Antarctic outlet glacier, and a recent study found that strengthening winds could cause seawater to undercut the ice shelf even faster in the future. Totten Glacier alone contains enough water to raise global sea levels by 11 feet. Part of the problem with Totten—and the Aurora Basin ice sheet in general—is that most of its bedrock lies below sea level. If the grounded part of the ice sheet pulls away from the underlying bedrock, the ice can in theory enter a state of sudden, dramatic retreat.